From the author of the internationally bestselling A Man Called Ove, a charming, warmhearted novel about a young girl whose grandmother dies and leaves behind a series of letters, sending her on a journey that brings to life the world of her grandmother’s fairy tales. When Elsa’s grandmother dies and leaves behind a series of letters apologizing to people she has wronged, Elsa’s greatest adventure begins. Her grandmother’s letters lead her to an apartment building full of drunks, monsters, attack dogs, and totally ordinary old crones, but also to the truth about fairytales and kingdoms and a grandmother like no other. 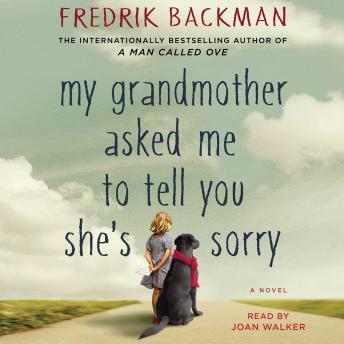 My Grandmother Asked Me to Tell You She’s Sorry is told with the same comic accuracy and beating heart as Fredrik Backman’s internationally bestselling debut novel, A Man Called Ove. It is a story about life and death and an ode to one of the most important human rights: the right to be different. This novel was a delightful surprise. I laughed and cried. It is a great one, especially if you miss your grandmother. I loved the relationship between Elsa and Granny. This was a beautiful story about relationships and how, when given the chance, people can understand and love others despite their differences and flaws. This is the 3rd book of Backman’s I have read (A Man Called Ove and Bear Town). I have enjoyed them all. Backman creates characters that become part of my world—even after I’m done reading the book! I really enjoy the author’s writing style. This is my new favorite novel- speaks to our needs on so many levels- narayion was great! I plan to listen to all backman books! I was captivated by the way the narrator described her fantasy world. So inventive and clever. Wonderful ending that me me want to recommend the book to my friends. Well, I read (heard on audio) this after reading Backman's BEAR TOWN and was expecting a lot. He certainly did not disappoint! Though this book was not at all what I expected - thinking it might be similar to BEAR TOWN. MY GRANDMOTHER ASKED... was totally different but had the wonderful threads between family, friends, pets that made Bear Town so loveable. I love the descriptive language and the individual characteristics that bring the people to life. Also the narrator was wonderful. I loved this book so much and hated for it to be over. The author did an amazing job developing the characters. I loved how the grandmother wove the life experiences of the characters living in the house/flats into her fairytales. Highly recommend this book! I concur with all the reviews about the well developed characters. The storyline of fairytales mixed with real life, so imaginative and enjoyable. The narrator was also wonderful. I truly enjoyed this audiobook experience.